A bell rings at the main road, signaling another corpse has been dropped off. For some, it’s the ultimate fate of their earthly remains, but for you, it’s your livelihood. In Graveyard Keeper, the latest release from indie game developer Lazy Bear Games based out of St. Petersburg, Russia, it falls upon you as a graveyard keeper to tend to the dead. On your property is a church and the final resting place of the area’s dead, and as bodies get delivered it’s up to you to bury them and spruce up their plots with headstones and fences. Your responsibilities don’t stop at the dead—you’ll also have to hold a weekly service for your congregation. 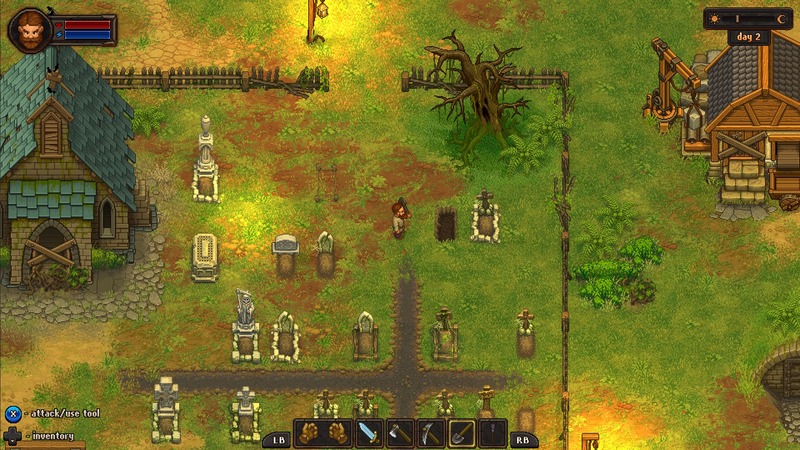 The gameplay in Graveyard Keeper takes inspiration from Harvest Moon and the more-recent Stardew Valley, and aside from tending to the recently deceased, there’s also gardening, foraging, fishing, and pursuing quests for the locals in the nearby town. This isn’t a typical medieval village—there are some bizarre characters, like the talking skull with a drinking problem that lives in your morgue, or the talking communist donkey that delivers corpses to the graveyard while spouting the ills of capitalism. This vein of dark humor runs throughout the game; a source of income can be harvesting flesh from corpses, stamping it with an illicit seal marking it as “approved meat,” and selling it to the local tavern. There’s a fairly robust technology tree with branches like smithing, building, and anatomy, behind which most new workbenches and creations are locked. Unlocking items requires points acquired from activities like cutting down trees, foraging food, and completing tasks in the church, and the grind to unlock new tech is long. Near the end of the tech tree, the grind for sufficient research points approaches levels only found in free-to-play mobile games. There is a distinct lack of tutorials (and of information in general) in Graveyard Keeper, leaving you to your own devices to figure out many systems. This is just one of many bizarre design choices—at times it feels like the game developers were gluttons for punishment. Once workbenches have been placed, they can’t be moved; if they’re disassembled for rearranging, you only get a portion of the building resources back, so you have to go grind resources just to build again. Want to make ink for the writing table? To do that, you need to unlock the alchemy bench. To unlock alchemy, you need to meet a specific character in the woods, and to trigger their appearance you need to progress a certain amount down another character’s quest chain. You’re not told any of that, of course. The amount of hoop-jumping tucked away behind obscure information gives me conniptions. Graveyard Keeper is a prime example of a “wiki game”; it’s inevitable to go searching online for answers. If you’ve ever played Stardew Valley or Harvest Moon, you know everything revolves around the energy bar. In Graveyard Keeper, the energy bar is downright draconian. Let’s say last night I interred a new corpse in the graveyard. I wake up and go to the stone-cutting bench and produce a headstone and a fence for the plot. From just those two actions, half of the energy bar is gone; go to the graveyard and install them and the energy bar is just about completely gone, and the day has barely begun. Sleeping restores energy, but rather than waking you up the next morning, it accelerates through the day—restoring an entirely depleted energy bar squanders over a quarter of a day. Certain events only trigger on certain days of the week, and having to sleep through portions of the day doesn’t help with time management. Graveyard Keeper also tries to throw in dungeon combat, though it turns out to be the definition of tedium. You delve into the catacombs beneath the church, similar to Stardew Valley’s adventures in the mines. Here, every swing of the sword drains a not-insignificant portion of the energy bar, and there’s no rushing through levels—each floor requires hunting down and defeating every enemy before moving on to the next floor. It got to be so dull, I could only be bothered to complete one floor at a time, compounded by frustratingly sluggish and inexact sword swings. While it sounds like I’ve piled on all the bad aspects, Graveyard Keeper does have that “one more day” quality once you’ve stockpiled enough building resources to really get on a roll. There’s macabre enjoyment in things like running a graveyard or researching and practicing new autopsy and body-preservation methods. The graphics are also quite lovely; the pixelated style is warm and vibrant with an impressive amount of detail. Graveyard Keeper is available on PC and Xbox One. I am hopelessly addicted to this weird game, but I definitely agree. It is a ton of work to accomplish ANYTHING. Personally I think it is a great game, it is not one off the so called A-titles that you start with expectation of a great gaming session only to find that 2 – 4 hours later there is the credits, GAME OVER. No you start this little indie gem and before you realize 4 hours are over and you barely scratched the surface of the game, yes, agreed it is complex and bloody difficult but man is it fun.